The aim of this work is to identify if the problems posed by the environmental degradation of the Caspian Sea could be such an issue. The results of cooperation on environmental issues would be twofold. First it would ensue direct action against the large-scale ecological degradation, protection against future threats, mitigation of existing problems, and adaptation to the current ecological situation. The second impact could be that by working together on one issue the participating actors would learn to act as a team, build up confidence in one another and experience the positive results of cooperation. Both objectives are highly challenging. 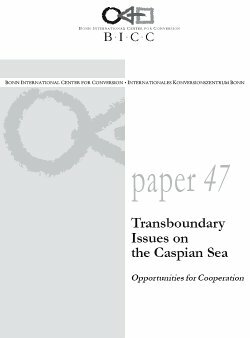 Reversing or stopping environmental threats is no easy, linear task, neither is—from the current perspective—confidence-building between the various states on the Caspian Sea. Nonetheless, for the sake of peace and security in the region, the author of this work believes that this task should be tackled.